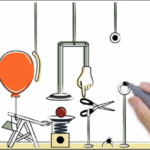 Business owners use whiteboard animations in several different ways. Some utilize them strictly for sales purposes, while others prefer to educate viewers about their product or service. The benefit to using these types of animations for business is that they’re fun to watch, and tend to capture the viewer’s attention far more than a standard white paper or corporate article. Whiteboard animations are particularly useful for explaining a sophisticated service that customers would have a hard time simply following on paper. This could include instructions on how to navigate a software program, or an explanation on a product manufacturing process. Whether you’re trying to sell a customer on the benefits of using your company, or educate them on how to best use your product or service, a whiteboard animation can deliver a clear and concise message to the customer in an interesting manner. The key to achieving success is to ensure that the video is professional, well written, and focuses on one subject. The viewer should walk away with a new awareness of your product, and an understanding of how they will benefit from your services. Be sure to use custom graphics to make your video stand out from the millions of other whiteboard animations, and highlight the main points without making the production too long. Use the three minute mark and a general rule.